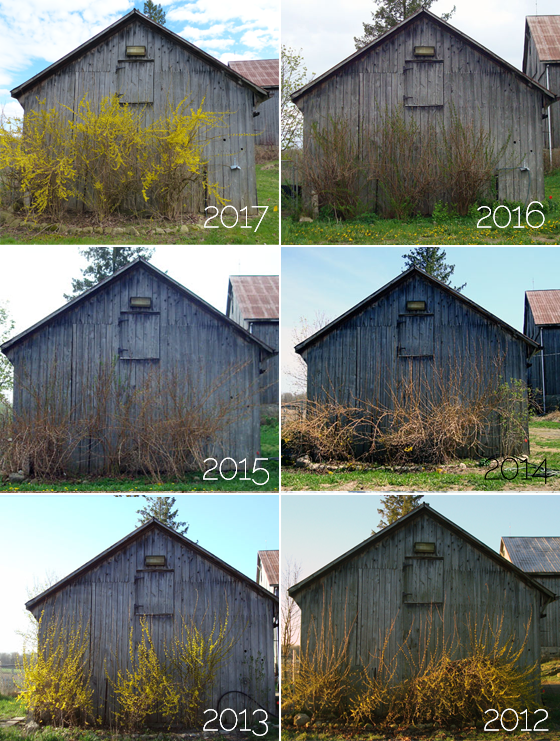 If you’ve been following the blog for awhile, you’ll know that every year I measure the progress of spring by our forsythia. Five years ago when we first moved to the farm, we had a huge bunch of blooms at the beginning of April. Every year since then, I’ve snapped a picture on April 2 to gauge how this year compares. This year, I somehow missed that. Oops. After two years of beautiful blossoms, though, our forsythia floundered. In 2014, 2015 and 2016–the last three years–blossoms have been few and far between. It’s a huge improvement over the last few years. 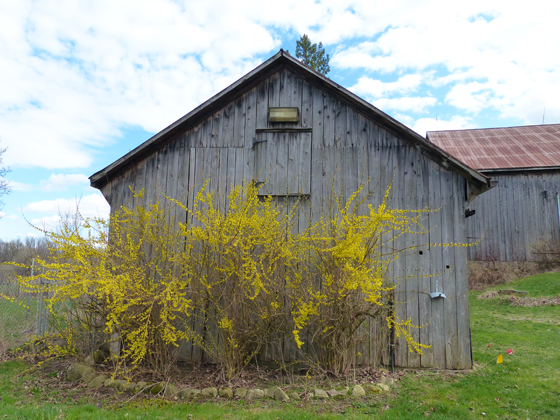 I’m so glad that the forsythia is flourishing again. Even better, there are some extra bushes that I’ve never noticed before at the edge of the front field. I don’t think I’ve shared this view of the house before. 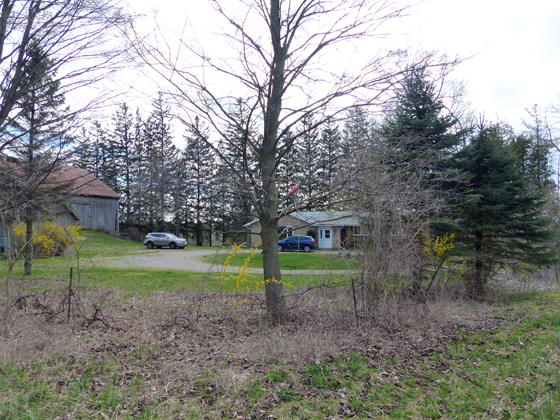 This gives you a sense of where our house sits in relation to the barn and the fields. (To take these pictures I was standing in the front field). 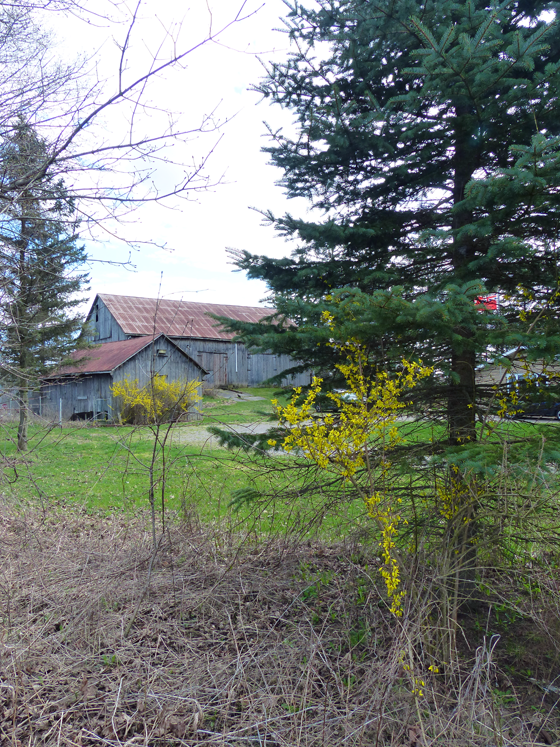 I love seeing spring take over the farm. I am so glad that your forsythia came out of it. I am sure it was frustrating for a couple years, but it looks better than ever! And those surprise bushes are very exciting! It was very frustrating. I wasn’t sure how to help them bloom. I’m still not sure that anything I did helped. 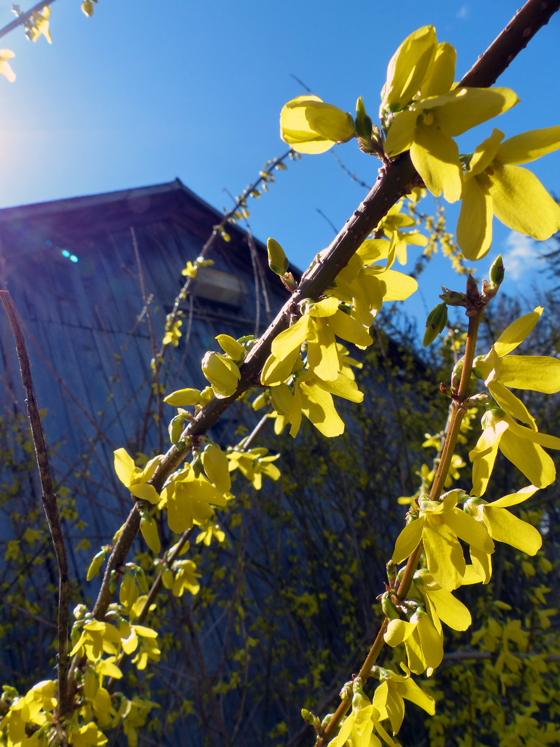 It seems to be a bumper year for forsythia around here. Yay, they’re here!! They are so pretty. Could it be that April 2nd is sometimes too soon for them? Oh, April 2 is definitely too early usually. They’ve “bloomed” end of April, start of May, mid-May and end of May over the last few years. However, the blooms have been piddly for the past three years.